(Nanowerk News) On the third floor of the Department of Informatics there is a robotics laboratory which looks like a playroom This is where researchers are testing how their robots can figure out how to move past barriers and other obstacles. “In the future, robots must be able to solve tasks in deep mines on distant planets, in radioactive disaster areas, in hazardous landslip areas and on the sea bed beneath the Antarctic. These environments are so extreme that no human being can cope. Everything needs to be automatically controlled. Imagine that the robot is entering the wreckage of a nuclear power plant. It finds a staircase that no-one has thought of. The robot takes a picture. The picture is analysed. The arms of one of the robots is fitted with a printer. This produces a new robot, or a new part for the existing robot, which enables it to negotiate the stairs,” hopes Associate Professor Kyrre Glette who is part of the Robotics and intelligent systems research team at Oslo University’s Department of Informatics, Norway. 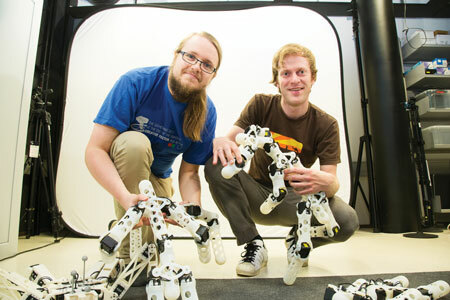 Even if Glette’s ideas remain visions of the future, the robotics team in the Informatics Building have already developed three generations of self-learning robots. Professor Mats Høvin was the man behind the first model, the chicken-robot named “Henriette”, which received much media coverage when it was launched ten years ago. Henriette had to teach itself how to walk, and to jump over obstacles. And if it lost a leg, it had to learn, unaided, how to hop on the other leg. A few years later, Masters student Tønnes Nygaard launched the second generation robot. At the same time, the Informatics team developed a simulation program that was able to calculate what the body should look like. Just as for Henriette, its number of legs was pre-determined, but the computer program was at liberty to design the length of the legs and the distance between them. The third generation of robots brings even greater flexibility. The simulation programme takes care of the complete design and suggests the optimal number of legs and joints. “We tell the simulation program what we would like the robot to do, how fast it should walk, its size and energy consumption. For instance, we may want the robot to be able to turn around and change direction, climb over boulders and walk on rugged ground,” says Kyrre Glette. In response, the simulation program suggests the optimal solution, including the shape of the body and the number of legs. It simulates thousands of possibilities and produces the best models by means of artificial evolution. In other words, the computer program comes up with a set of proposals for different robots designed for optimal functionality. “None of them is intrinsically better than the others. The only difference is their strategies for solving the tasks,” says research fellow Eivind Samuelsen. Unfortunately, it is difficult to arrive at the perfect solution by way of simulation, because our wish-list of what we want the robots to do is becoming increasingly complicated. Simulation is not enough. In order to test the functionality of the robots, they need to undergo trials in the real world. The robots are produced as printouts from a 3D printer. “Once the robots have been printed, their real-world functionalities quite often prove to be different from those of the simulated versions. We are talking of a reality gap. There will always be differences. Perhaps the floor is more slippery in reality, meaning that the friction coefficient will have to be changed. We are therefore studying how the robots deteriorate from simulation to laboratory stage,” says Mats Høvin to the research magazine Apollon. The robots are frequently only half as good in real life. The researchers are looking at the robots’ ability to learn and practice even at the simulation program stage. “We then proceed to check whether the robots are able to learn in a real-world setting. One of the tests is to see how the robots react to obstacles,” says Samuelsen. The robotics team are currently comparing the performance of five robots which in theory should be equally good. Three of the five robots have four legs, one has three, another has six. The fewer legs, the less energy is consumed. One of the robots is fitted with single-joint legs. The others have legs with two joints. Just like in the natural world, the researchers have therefore opted to restrict the number of joints to two. “Single-jointed legs enable the robot to walk forward efficiently, but it will find it difficult to turn around,” Glette points out. When the researchers are testing the robots, they set up an obstacle course to enable the robots to teach themselves how to pass the hurdles. The researchers hope that in the future, the robots will be able to give automatic feedback to the simulation program about how well they work, so that the next time around, the computer will be in a position to design an even better robot. 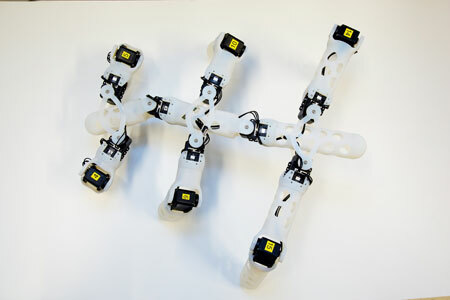 3D printers make it possible to create sophisticated robots and other objects. The 3D printer is also able to print objects with large cavities, such as a ship in a bottle. 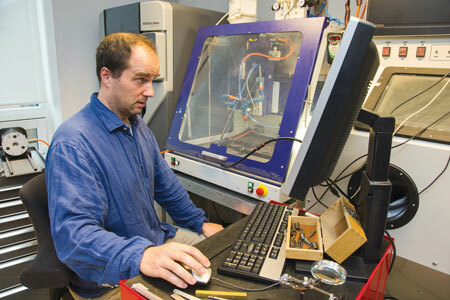 Mats Høvin makes robots in 3D-printer. “The 3D printout is based on a mathematical model, described as polygons, of whatever it is you want to print,” says Mats Høvin, who is currently testing out the technical production limits, like how thin or thick the legs of the robot can be. There are a number of different types of 3D printers. The printers at the University of Oslo cost between NOK 400,000 and three million. The more expensive, the better the detail. “NATO want to use the printers to create spare parts for replacing damaged ones during field operations. This would mean same-day fabrication. Some pastry chefs are already making use of 3D printers to bake sophisticated cakes. There are even printers that build houses. This means that the building contractor can set up an enormous crane that will print the entire building, including the cement, the insulation and everything else. Clever! And you won’t have to bother about getting the craftsmen in,” says Mats Høvin. Not all 3D printers produce their output layer by layer. Some 3D printers mill the superfluous material off in blocks. The latest printers are able to combine the milling and layering techniques in the same operation. One of the main benefits for the robotics team at Blindern is the short route from the ideas stage to the robot-testing stage. “Nevertheless, there are many practical challenges ahead before our robots can be exploited commercially. Our greatest challenge is to develop robust algorithms and a system which is able to make use of imprecise simulations,” says Kyrre Glette.